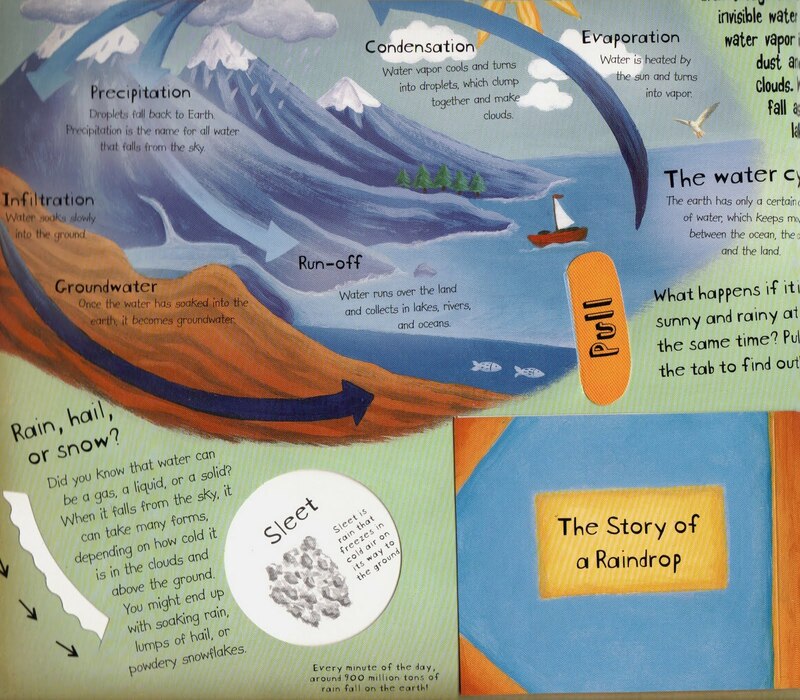 If you read my review of How the World Works by Christiane Dorion, with illustrations by Beverly Young and paper engineering by Andy Mansfield, then you will have an idea just how cool How the Weather Works is. These books are perfect for curious minds from age four to fourteen. Packed with information that comes in little bites and bigger chunks, you can pick and choose what you read to your listeners and your readers can do the same when they sit down with this book. As I said in my review of How the World Works, besides being a writer, Christiane Dorion is an educational consultant who has taught sustainable development for more than twenty years. 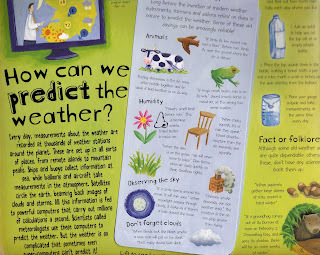 This means that the final pages of How the Weather Works is dedicated to the question, "Are we changing the climate?" 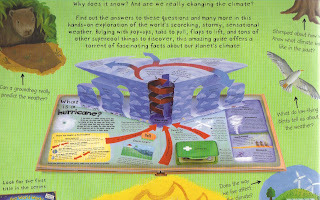 What's changing, the greenhouse effect, what the future holds and a great pop-out showing the different greenhouse gasses and how they are added to the atmosphere are topics covered in this section. The final corner of the book is dedicated to the question, "What do you think?" 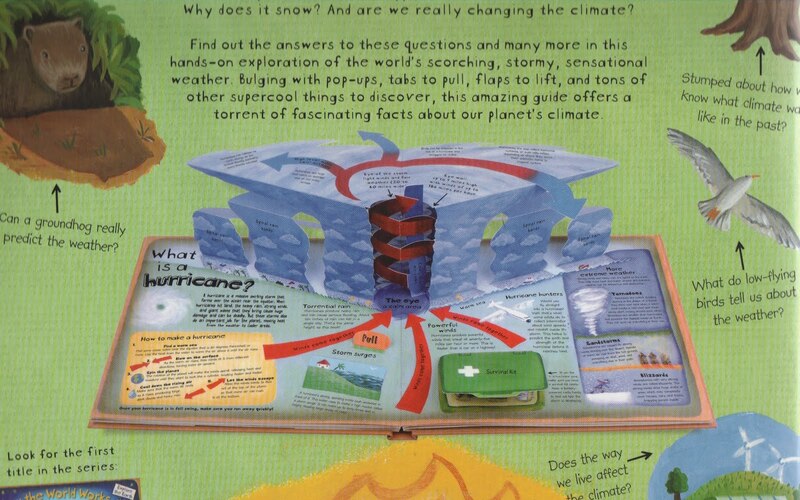 telling the reader, "We don't understand fully how the climate works. It's hard to imagine that tiny changes in the atmosphere can disrupt the entire climate of our planet, but it's already changing. Should we wait and see what happens? Or should we take action now?" 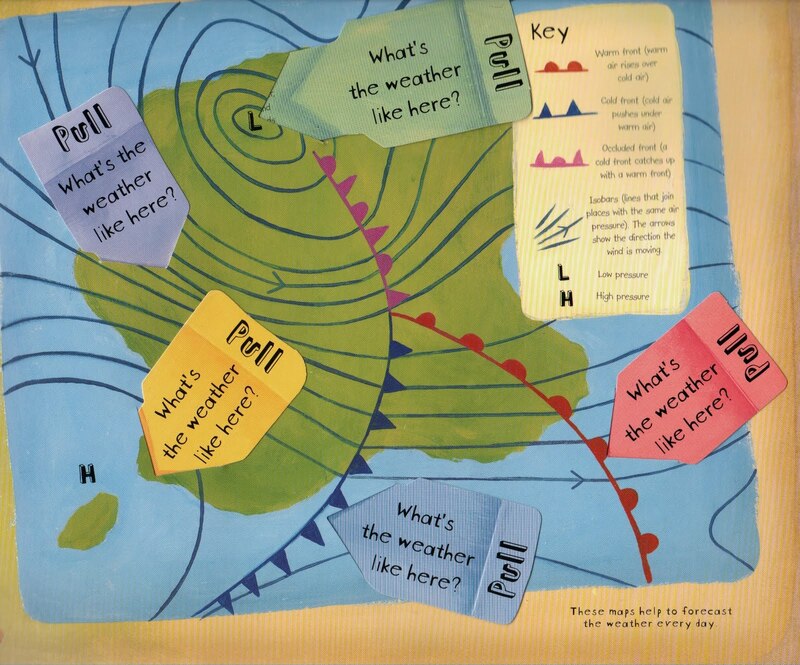 Other topics covered include, What is a Hurricane?, as seen in the illustration above. There is a little green suitcase that opens up to reveal important items to have in a survival kit, all the elements that go into making a hurricane and examples of more extreme weather. 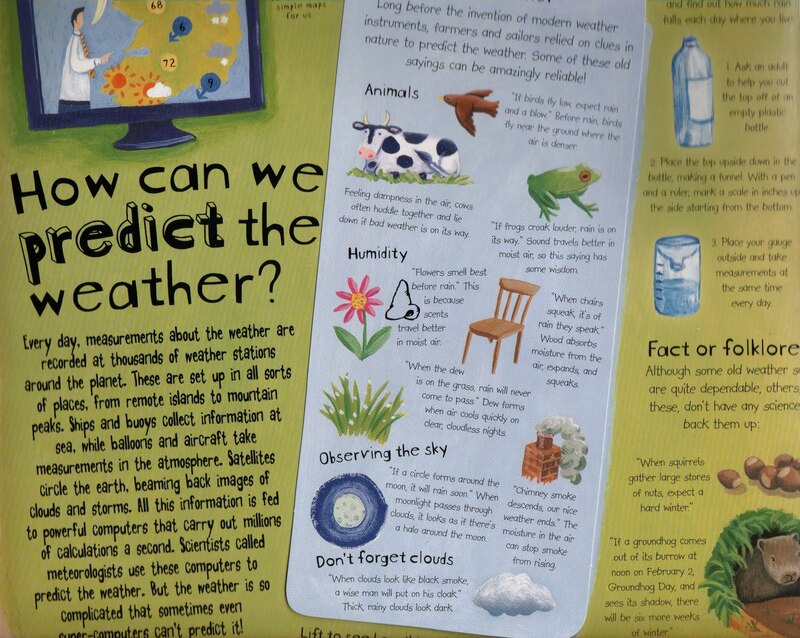 How Can We Predict the Weather, as seen below, has a very cool flap that, on the top, shows ways that we used to predict the weather that are not as kooky as you might think. 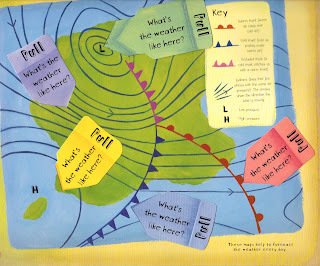 Under the flap there is a list of discoveries and inventions that have helped to understand and predict weather. 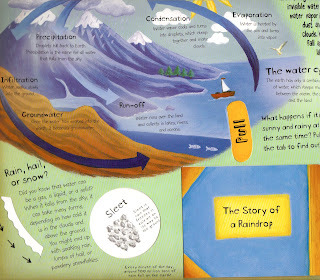 What Causes the Weather, Where Does Rain Come From, What's a Weather Front, Why Does the Wind Blow, What is Climate and What Was the Climate Like in the Past are other topics covered in this fabulous book. If your children have no expressed interest in science and how things work, consider this book the sneaky chef of educational books. Like a broccoli brownie, How the Weather Works is sneaking the food that's good for you (non-fiction) in with the yummy treats (pop-ups).